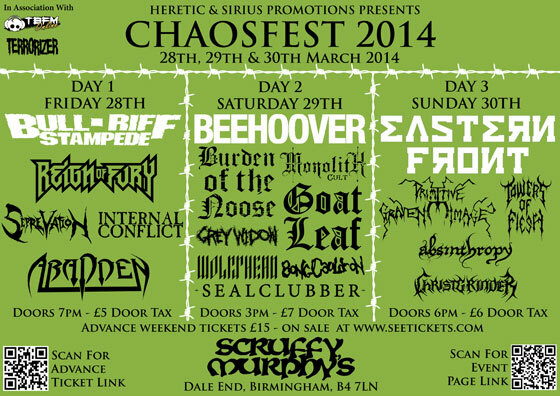 Now in 2014 ChaosFest has gone from strength to strength by being able to book international touring bands such as Beehoover whilst attracting an ever increasing quality of band and the attention of nation media such as Terrorizer Magazine and TBFM Radio. Also in 2014 theyhave ‘Thrashers’ Bull-Riff Stampede and ‘War-Torn Black Metal Titans’ Eastern Front headlining the 1st and 3rd days, with a full complement of 15 other bands storming the Scruffy’s stage! Weekend tickets are available now for £15 from Heretic‘s webstore HERE, but if you just want to attend one of the days, you’ll be able to pay on the door on the day. There’s also a Facebook event set up for the weekend which you can check out HERE. Weirdo Canyon Dispatch – Roadburn 2015 Daily Fanzine Issue #1 Now Available!